Fig. 28 Concentration measures. (a) Cumulative concentration curves, showing the cumulative share of market size accounted for by various (cumulative) numbers of firms. 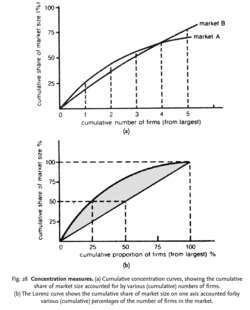 (b) The Lorenz curve shows the cumulative share of market size on one axis accounted forby various (cumulative) percentages of the number of firms in the market. The measures of the size distribution of firms engaged in economic activities. The broadest concentration measure is the aggregate concentration measure, which looks at the share of total activity in an economy accounted for by the larger firms, for example, the proportion of total industrial output accounted for by the largest 200 firms; or the share of total manufacturing output produced by the 100 largest companies. Various size criteria may be used for this measure, in particular, sales, output, numbers employed and capital employed, each of which can give slightly different results because of differences in capital intensity. Such measures serve to give an overall national view of concentration and how it is changing over time. Although aggregate concentration measures are useful, they are generally too broad for purposes of economic analysis where interest focuses upon markets and performance in these markets. Consequently, economists have developed several measures of MARKET concentration that seek to measure SELLER or BUYER CONCENTRATION. The most common of these measures is the CONCENTRATION RATIO, which records the percentage of a market's sales accounted for by a given number of the largest firms in that market. In the UK it has been usual to estimate the concentration ratio for the three or (more recently) five largest firms, whereas in the USA the four-firm concentration ratio tends to be employed. The concentration ratio, however, records only seller concentration at one point along the cumulative concentration curve, as Fig. 28 (a) indicates. This makes it difficult to compare concentration curves for two different markets, like A and B in the figure, where their concentration curves intersect. For example, using a three-firm concentration ratio, market A is more concentrated while using a five-firm ratio shows market B to be more concentrated. An alternative concentration index, called the HERFINDAHL INDEX, gets around this problem by taking into account the number and market shares of all firms in the market. The Herfindahl index is calculated by summing the squared market shares of all firms. The index can vary between a value of zero (where there are a large number of equally sized firms) and one (where there is just one firm). Concentration measures, like the concentration ratio and the Herfindahl index, are known as absolute concentration measures since they are concerned with the market shares of a given (absolute) number of firms. By contrast, relative concentration measures are concerned with inequalities in the share of total firms producing for the market. Such irregularities can be recorded in the form of a Lorenz curve as in Fig. 28 (b). The diagonal straight line shows what a distribution of complete equality in firm shares would look like, so the extent to which the Lorenz curve deviates from this line gives an indication of relative seller concentration. For example, the diagonal line shows how we might expect 50% of market sales to be accounted for by 50% of the total firms, whilst in fact 50% of market sales are accounted for by the largest 25% of total firms, as the Lorenz curve indicates. The Gini coefficient provides a summary measure of the extent to which the Lorenz curve for a particular market deviates from the linear diagonal. It indicates the extent of the bow-shaped area in the figure by dividing the shaded area below the Lorenz curve by the area above the line of equality. The value of the Gini coefficient ranges from zero (complete equality) to one (complete inequality). In practice, most market concentration studies use concentration ratios calculated from data derived from the census of production. Concentration measures are widely used in economic analysis and for purposes of applying COMPETITION POLICY to indicate the degree of competition or monopolization present in a market. They need to be treated with caution, however. On the one hand, they may overstate the extent of monopolization. First, the boundaries of the market may be defined too narrowly (for example, the ‘beer market’) when it might be more appropriate to adopt a wider interpretation of what constitutes the relevant market by including actual and potential substitutes (for example, the ‘alcoholic drink market’, which includes also spirits and wines). Thus, calculating a firm's market share in terms of the beer market alone may make it seem more powerful than it actually is. Secondly, concentration ratios are usually compiled by reference to the output of domestic suppliers, thus ignoring the competition afforded by imports. Thirdly, market concentration is only one element of market structure. If BARRIERS TO ENTRY to the market are relatively low, or suppliers are confronted by powerful buyers, again the market may well be much more competitive than shown by the concentration ratio. On the other hand, concentration ratios may understate the degree of monopolization. First, the market may be defined too broadly when a narrower specification of the market's boundaries may be more appropriate. This can be important in the context of suppliers who deliberately choose to ‘focus’ on a narrow segment of the market (see COMPETITIVE STRATEGY). Secondly, conduct elements as well as structure variables need to be considered. For example, while superficially a market with a low or moderate degree of seller concentration may appear to be competitive, in practice it may be highly monopolistic because the suppliers have set up a price-fixing CARTEL. Thus, looked at ‘in the round’, concentration ratios are but one aspect in examining the dynamics of a market and whether or not it exhibits competitive or monopolistic tendencies. In this paper, some estimation methods for Gini and Zenga concentration measures are presented together with their application to the analysis of income distributions in Poland by socio-economic groups. The latter concentration measure has, as other concentration measures, a weight bias, placing greater weight on larger market share differences. The additive concentration measures cover all the criterion bearers' values of the ordinate of the concentration curve. Another interesting observation is that all of our concentration measures are comparable to what have been documented by Dumais et al. By the last decade of the 20th century, 51 counties had decreased concentration measures. In terms of the different concentration measures employed, the one-firm concentration ratio results in the highest adjusted R-squared in the parametric regression. Is the market concentration and interest-rates relationship in the Mexican commercial banking industry a sign of efficiency? Radon concentration measures are required if relevant indicators show that reference levels may be exceeded. Along with concentration measures, temperature and relative humidity were also continuously recorded using HOBOs (Onset Computer Corporation, Bourne, MA). In addition, the data make it possible to compare local loan-market concentration measures with measures of market concentration on the basis of deposits in local institutions to determine whether the deposit-based measures are useful approximations of loan-market concentration. Coverage rates and concentration measures are listed in Table 1 for each state, sorted by coverage (lowest to highest). To be sure, recent bank mergers have led to a substantial rise in national concentration measures. These concentration measures are the four-firm concentration ratio (CR4), the Herfindahl-Hirschman index (HHI), the Horvath index (HI), and the Rosenbluth index (RI).